Dr. Russell’s “Body of Qi” CD health and wellness series! 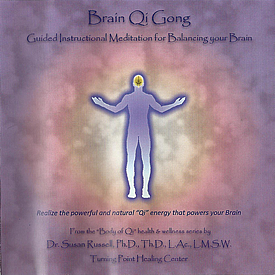 Get all four CD’s from Dr. Russell’s “Body of Qi” balance and wellness series, Brain Qi Gong, Living Bones, Living Qi Channels, Wei Qi for the special price of $80! 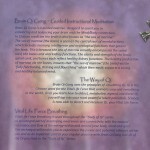 (plus tax on GA orders) – $8 off the regular price! 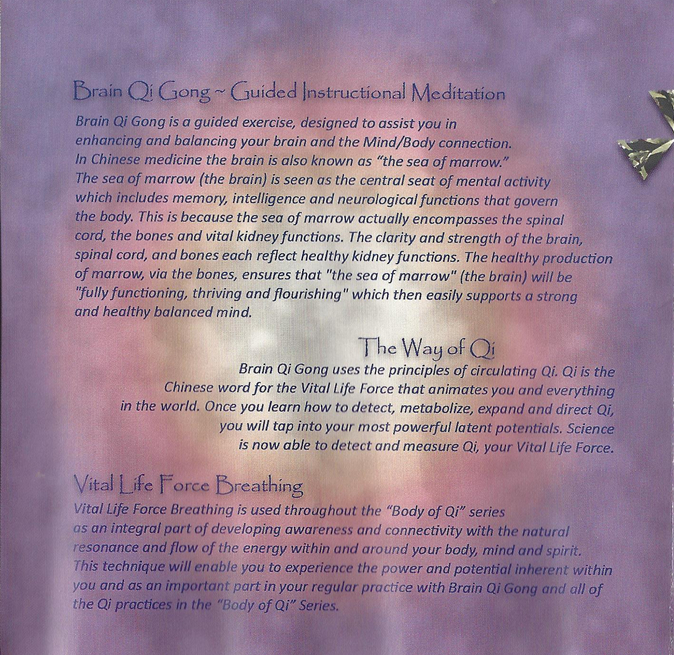 Brain Qi Gong is a guided exercise, designed to assist you in enhancing and balancing your brain and the Mind/Body connection. 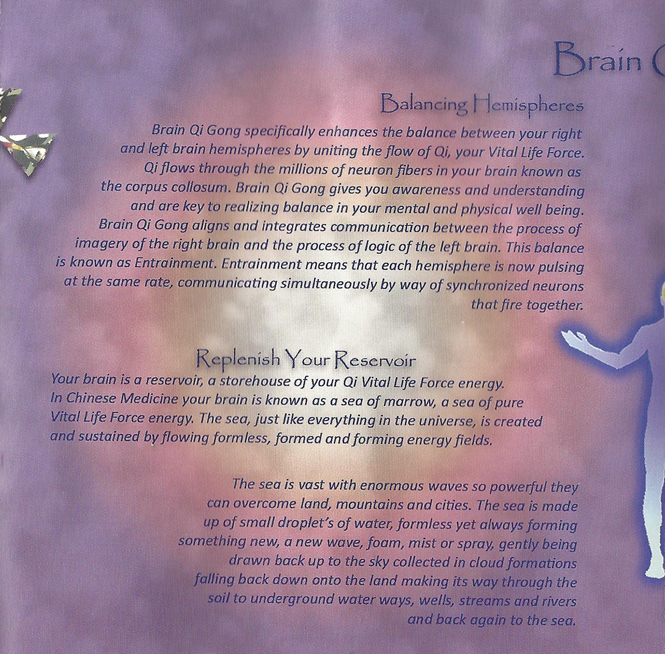 In Chinese medicine the brain is also known as the “sea of marrow.” The sea of marrow is seen as the central seat of mental activity which includes memory, intelligence and neurological functions that govern the body. 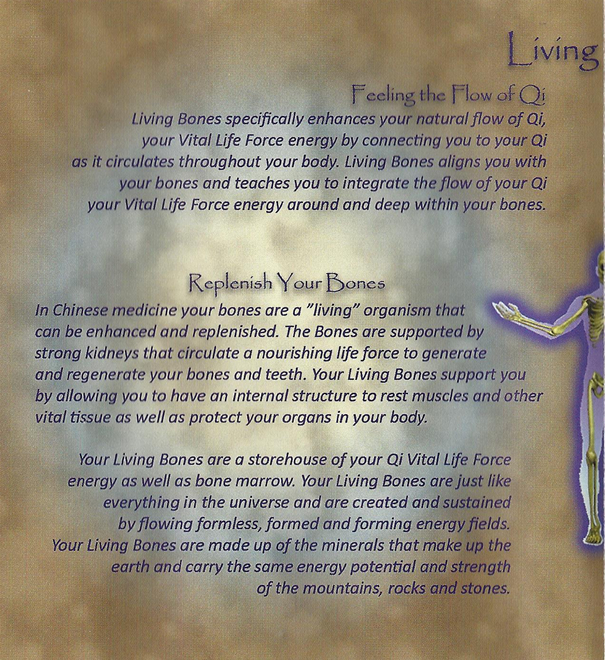 This is because the sea of marrow actually encompasses the spinal cord, the bones and the vital kidney functions. 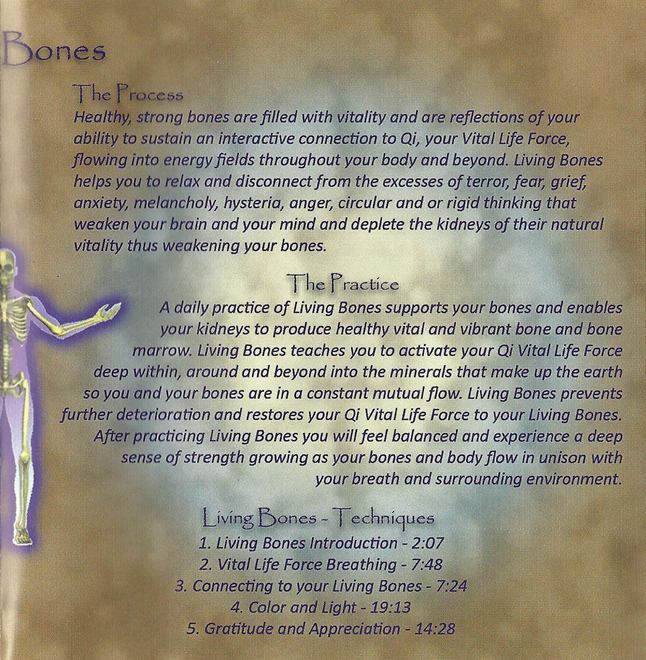 The clarity and strength of the brain, spinal cord, and bones each reflect healthy kidney functions. 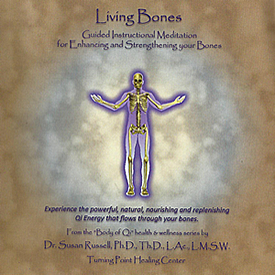 The healthy production of marrow, via the bones, ensures that the “sea of marrow” will be “fully functioning, thriving and flourishing” which then easily supports a strong and healthy balanced mind. 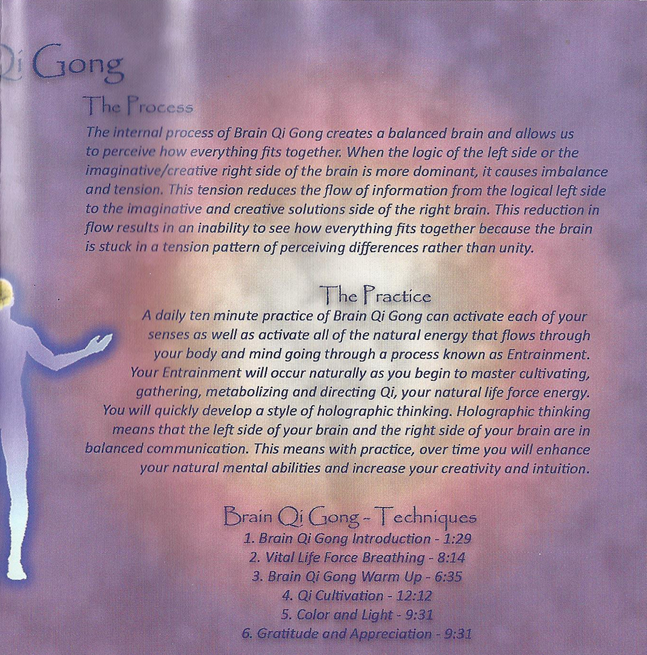 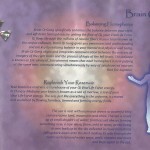 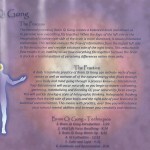 There are four individual steps to Brain Qi Gong that take about 30 minutes to complete. 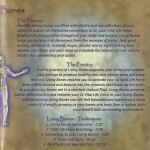 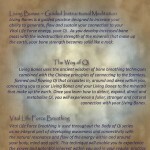 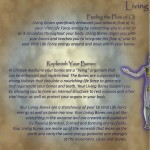 Living Bones is a guided practice designed to increase your ability to generate, flow and sustain your connection to your Vital Life Force energy,, also known as Qi (pronounced “chee”). 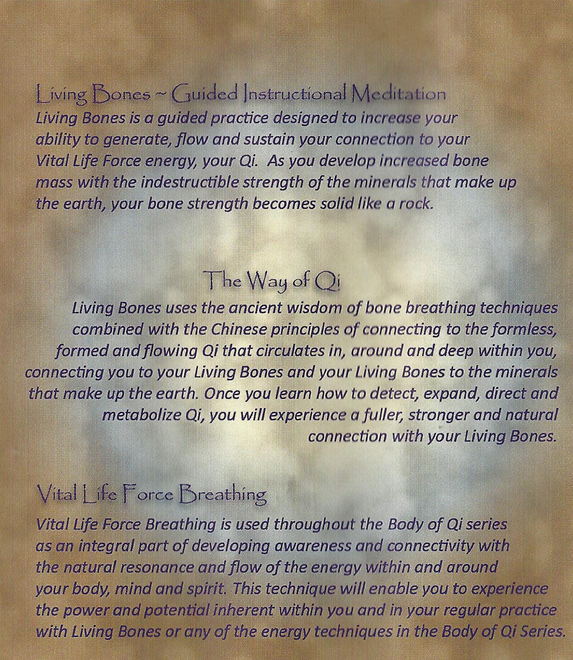 As you develop increased bone mass with the indestructible strength of the minerals that make up the earth, your bone strength becomes solid like rock. There are three individual steps to Living Bones that take about 30 minutes to complete. 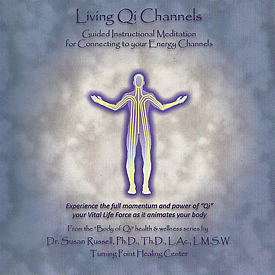 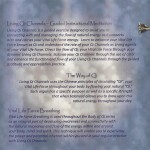 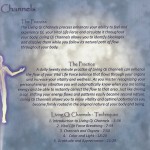 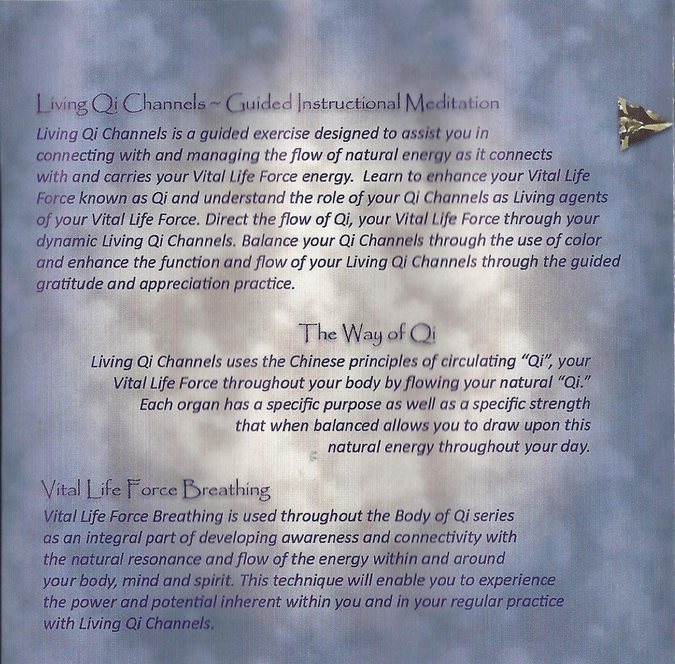 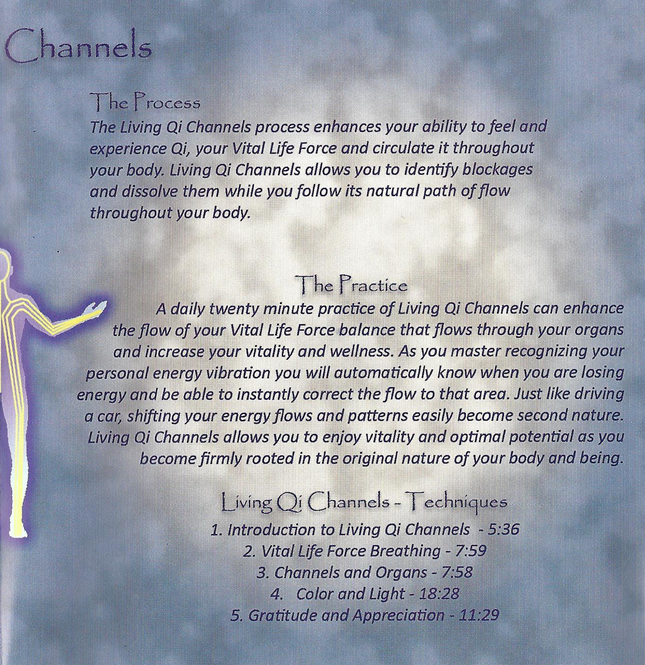 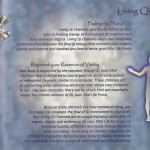 Living Qi Channels is a guided exercise to assist you in connecting with and managing the flow of natural energy as it connects with and carries your Vital Life Force energy, also known as Qi (pronounced “chee”). 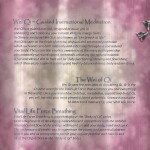 Learn to enhance your Qi and understand the role of your Qi Channels as Living agents of your Vital Life Force. 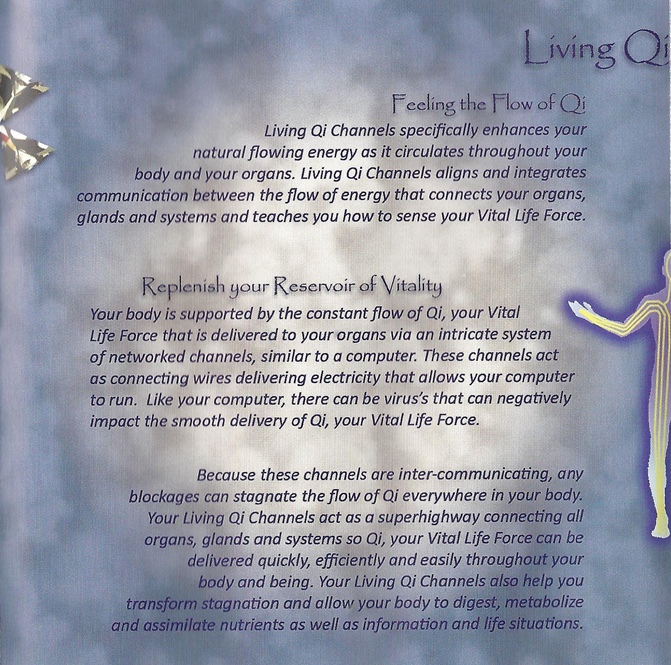 Direct the flow of Qi, through your dynamic living Qi Channels. 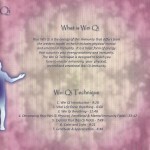 Balance your Qi Channels through the use of color and enhance the function and flow of your Living Qi Channels through the guided gratitude and appreciation practice. 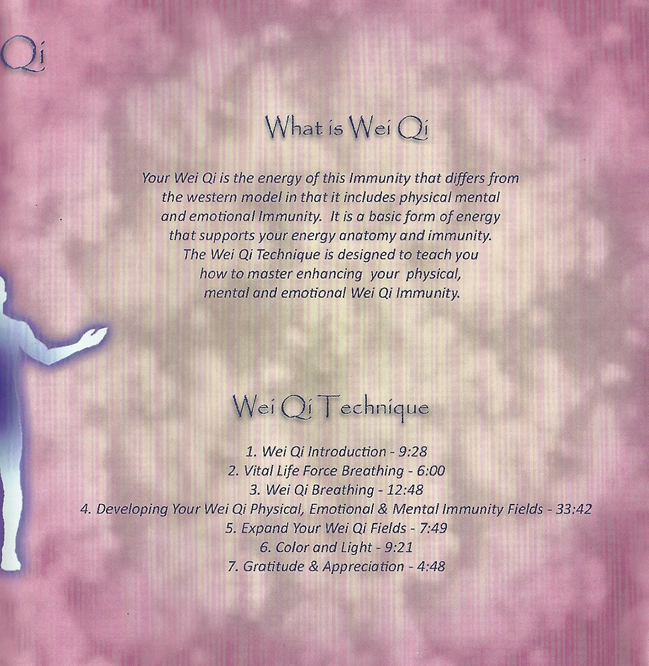 Wei Qi is a guided exercise designed to assist you in enhancing and balancing your natural immune energy fields. 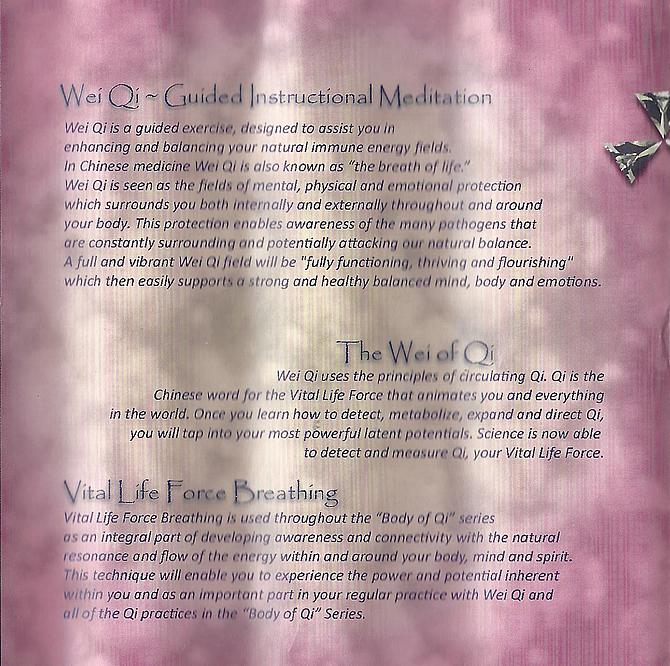 In Chinese medicine, Wei Qi is also known as the “breath of life.” Wei Qi is seen as the fields of mental, physical and emotional protection which surrounds you both internally and externally throughout and around your body. 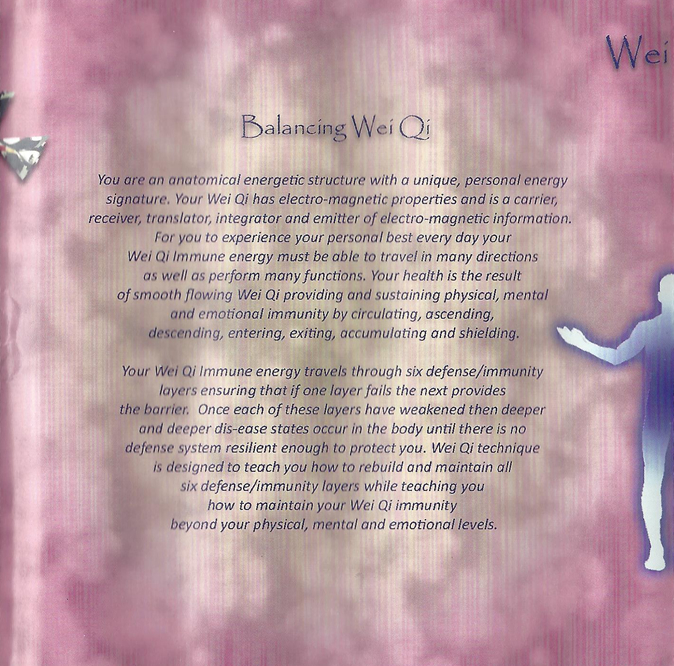 This protector enables awareness of the many pathogens that are constantly surrounding and potentially attacking our natural balance. 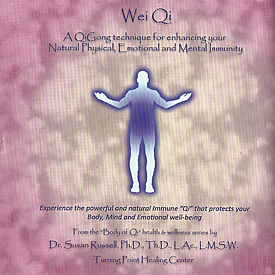 A full and vibrant Wei Qi field will be “fully functioning, thriving and flourishing” which then easily supports a strong and healthy balanced mind, body and emotions.